Cycle carts to carry goods are used frequently in towns and cities of India. These three-wheeled carts have a cycle attached which makes it easy to maintain and inexpensive to run. They have a small load carrying capacity. However these vehicles are used in fairly innovative ways as the first picture demonstrates. This man is smoking a bidi as he rides his cycle cart on a cold morning near Jaipur, in Rajasthan. Believe it or not this small cyclecart is carrying long flexible pipes which are potruding for several feet, if not meters, outside his vehicle. This would be considered a dangerous vehicle on the roads of any developed country but for India, this is common. The traffic police would not bother to penalize this driver who is trying to earn a living. 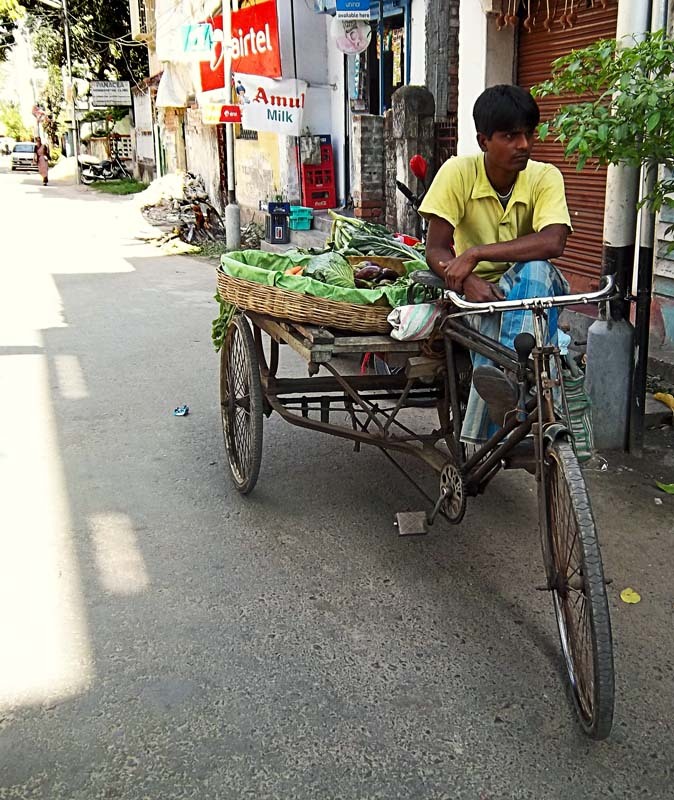 This is a smaller cycle cart which is being used to a large wicker basket full of vegetables. Some vegetable vendors carry this on their heads and a lucky few have a vehicle to cart it around in. This photograph was shot in Kolkata. This man is carrying a sheet or sheets of metal on his cycle cart. 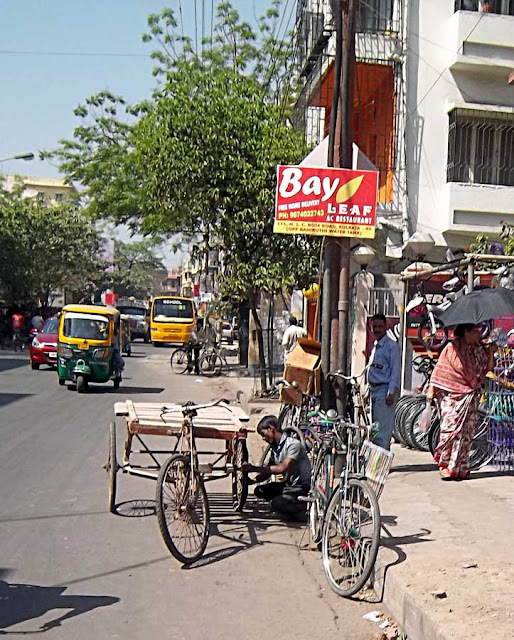 A photograph from Kolkata. 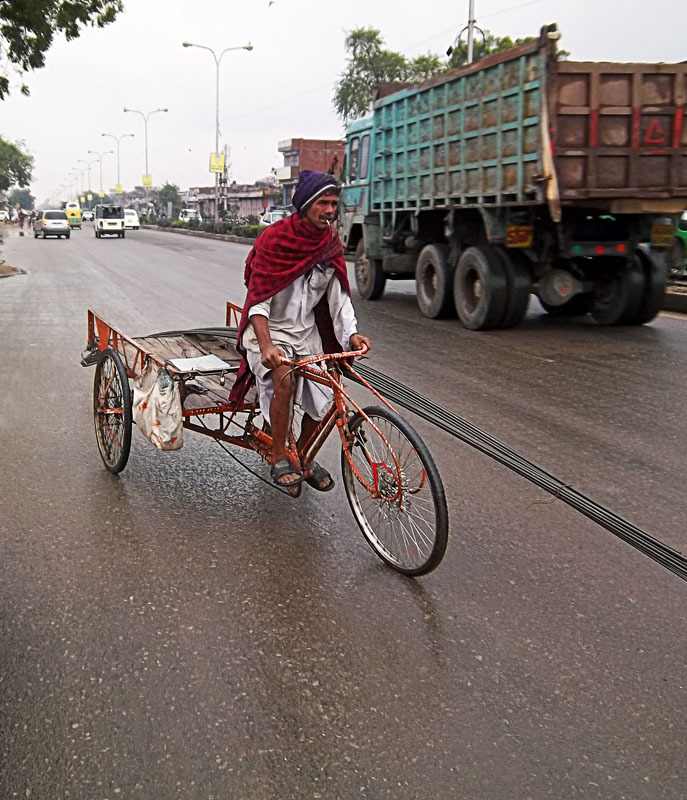 Another image shot in Kolkata, of a cycle-cart driver fixing a wheel. 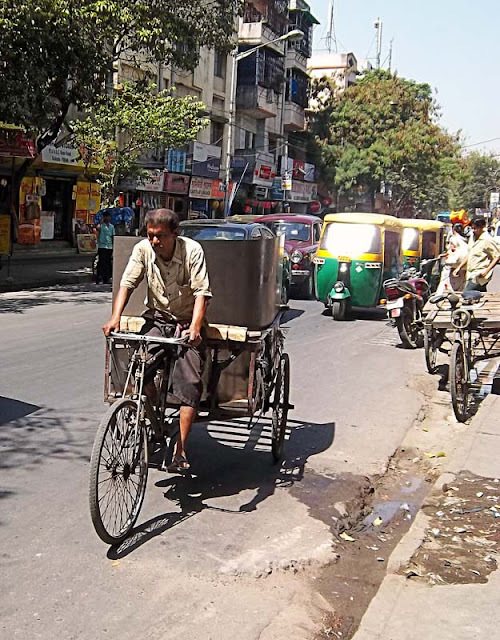 or Cycle Rickshaws in India or Hand-Pulled Rickshaws or try the label "Transport" for pictures of a variety of vehicles.